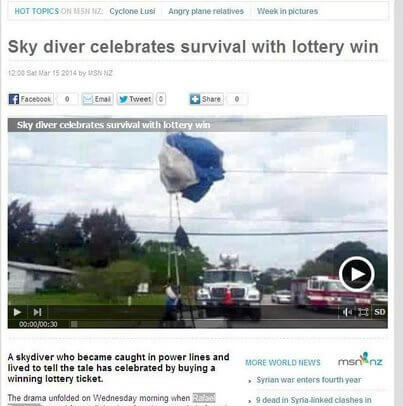 A very lucky man was blessed to be alive after his parachute got entangled with power lines in Florida. And what does he do to celebrate? Rafael Ramirez bought a lottery ticket. The sky diver got blown off course by strong winds after jumping from a light aircraft and had to land in Sebastian, Florida. As he landed, however, his chute got entangled with power lines and sparks started flying. Though frightened by his ordeal, he feels lucky to be alive. Perhaps wishing to see how long his luck will hold, he bought the lottery ticket and won $5. But his biggest blessing that day was surviving his close encounter with power lines.